As content marketers, we create experiences that connect with our target audience. By forming these connections, we increase brand perception and preference, lower barriers, and eliminate objections. Ultimately, we want our content marketing to drive positive business outcomes and brand loyalty. Each month, we busily work away at our content calendar: blog posts, contributed articles, webinars, infographics, white papers, and more. Our content marketing strategy is seemingly sound. What could it be missing? According to Tom Webster, senior vice president, strategy and marketing at Edison Research, audio is a powerful medium underused by content marketers. Tom notes that the path to brains via the ears (i.e., sound) is faster than the path through the eyes (i.e., sight). It’s a more primal path. “When you hear a baby cry or when you hear someone scream, it instantly goes into your brain and you understand that this is something that is grabbing you on multiple levels,” Tom says. He delivered a presentation at Content Marketing World, Developing a Holistic Audio Content Strategy. In this article, you can learn the key takeaways from Tom’s presentation. Podcasting is not a holistic audio content strategy. It’s a start, but a comprehensive strategy goes well beyond it. Let’s consider the data Tom shared to convince us of the need for an audio strategy. The 2018 Infinite Dial study shows that two-thirds of the country listened to some form of digital audio in the previous month (e.g., Spotify, Pandora, podcasts). Over 22% of the United States (about 73 million people) listened to a podcast in the previous month. Edison Research measures the devices people use to consume audio content, a concept called Share of Ear®. Over the past few years, according to Tom, podcasts have overtaken AM-FM radio for the Share of Ear. “That’s a significant change in human behavior,” he says. Marketers can take advantage of that shift. While it’s hard to get our content on terrestrial radio, there’s nothing stopping us from launching a podcast. Audio also is a convenient way to consume content. With a printed book, you are limited to times when you can sit down and read it. With audio, you can consume the book while sitting and moving, whether it’s the walk to lunch or a drive to work. An Edison Research-NPR report found that almost one in five Americans say they own a smart speaker. That’s nearly tripled year over year, which is the fastest growing technology we have ever tracked in 20 years. Faster than smartphones, faster than digital audio, and faster than podcasting,” Tom says. About 43% of respondents said they purchased the smart speaker specifically to reduce screen time. It makes sense – using your voice to ask a question or take an action is easier than typing or tapping a keyboard. Audio will grow as the prevailing medium, especially as audio-enabled technology is further embedded in cars, household appliances, and other devices used daily. Now, let’s consider important elements of your audio content strategy. “A brand that has a sound and has a holistic strategy for it becomes a friend quicker than a brand that is only experienced by text,” Tom says. Consistency is essential. I bet you can recognize this line from the Motel 6 TV commercials: “We’ll leave the light on for you. Tom Bodett introduced himself by name in the spots he voiced for 30 years. Most likely, Motel 6 or its agency developed a creative brief that described a character and sound like Bodett’s. If Bodett was no longer available, the creative brief describing the profile – including the sound – could be resurrected to find a replacement. What do customers do throughout their days? What’s a problem they’re struggling with? Can you help them in that moment? Those are opportunities to use audio to win the hearts of customers, Tom says. Chompers can be played from any podcast player. There’s also an Alexa Skill for Chompers, so parents can say to their Amazon Echo, “Alexa, start Chompers.” Not only is the content contextual, but so is the delivery mechanism. For this topic, audience, and environment, audio is more effective than text or video. “There’s all kinds of ways to get your message in if you’re contextually relevant. Chompers is absolutely brilliant and it is a way to make people feel good about Crest without being a podcast about Crest,” Tom says. The Alexa Skill from WebMD is helpful. People voice their symptoms. The Skill asks about additional symptoms and the inquirer replies. Alexa shares the most likely condition or illness based on the symptoms. That brief interaction with WebMD also can accrue brand preference and brand loyalty with the audience. “That was a little piece of a brand voice, in a little, helpful interaction that can happen in an everyday moment. Little things you could possible solve,” says Tom. Tom notes that building Skills for Alexa or Google Home isn’t difficult. “It’s one of the easiest bits of programming I’ve ever seen in my life,” he says. While people are listening to more podcasts, the supply is growing faster than the ability to consume them. To stand out and gain the attention of your target audience, Tom says you need to be entertaining. “Don’t just be something that gives facts. Don’t just talk about routers. Be entertainment. Be a show,” he says. See what I did? The above headline is an example of well-recognized brand audio identity – the “Test Man” in Verizon Wireless commercials. If you can hear me now, it means that you’re on board with the “why” for an audio content strategy. As the Edison Research report showed, people are listening more to digital audio content and verbally interacting more with screenless devices. Think about how to create the sound of your brand and how you might leverage smart speakers to provide value to your prospects and customers. 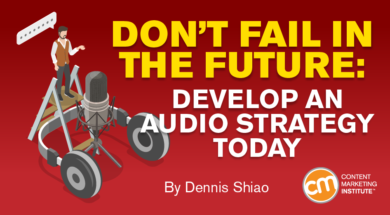 Do you already have a holistic audio strategy? Are you planning to create a strategy soon? Share the details in the comments. Hear expert insight from over 100 presenters at the largest content marketing event in the world. Register today to attend Content Marketing World September 3-6 in Cleveland, Ohio. Use the code BLOG100 to save $100.